Work your way to fabricating success People have been hammering metal into shields, cookware, and ceremonial headdresses for centuries, and fabrication continues to be a popular and growing industry today. 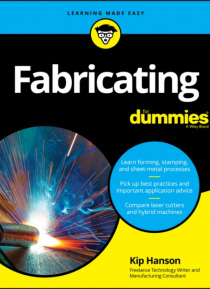 Fabricating For Dummies provides you with all the information you need to begin learning about metalworking, or fill any gaps in your existing knowledge in order to advance your career. Simply p… ut, there's little out there for light reading on manufacturing. What's available is often quite expensive, so boring it puts you to sleep, or filled with so much technical gobbledygook that one's eyes glaze over within a few pages. This book offers a much-needed alternative, cutting through the jargon and getting right to the heart of what you need to know to take your fab skills to fabulous new heights. Get a glimpse of the day in the life of a fab worker Discover the different alloys, shapes, and sizes of sheet metal Understand welding and joining processes Master the use of press brakes, stamping presses, and turret punches Whether you want to get your feet wet with waterjets, laser cutters, or hi-definition plasma cutters, there s something for you inside this hands-on book!